It’s that time of year. Spring is here(well it will be once this snow melts) and parents start thinking about summer. TLC for Kids can help you with your summer childcare needs. We have wonderful nannies that are interested in securing work for the summer. Hiring a nanny is the best option for St. Louis families, whether you are looking for full-time or part-time childcare. Hiring a summer nanny from TLC is like having your very own camp counselor! Summer nannies will schedule fun parent-approved outings for the kids like going to the amusement park, swimming, museum, bowling, play groups, the zoo and more. TLC summer nannies will also do tutoring over the summer so that your kids are on track for their upcoming school year. Visit our website today to complete the summer nanny application. Our staff is busy this spring break interviewing college students who want to be summer nannies! 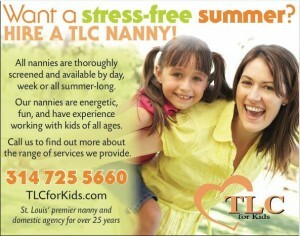 Summer nannies from TLC will make this summer fun. Your kids will love going to the pool, museums, the park and any other attractions. TLC is happy to offer an early bird special to all clients who turn in an application by April 30th. You can save $100 off the Application Fee and $50 off the Placement Fee so hurry over to the TLC website and apply now!! In 1985, Sharon Graff Radell, prepared her college thesis on women working in leadership roles. Through her research, she was inspired by the stories of professional working moms who needed extra child care support that was just not available in the market. She discovered an acute need for high quality in-home child care services. She decided to fill a niche and create a business that would provide screened, experienced nannies and babysitters with 24/7 availability. When she discussed her idea with a friend who was struggling with the difficulties of balancing work and family, her friend said “if you really want to do something for working moms, do more than just finding nannies; we need back up care and sick childcare.” In the next 6 months, Sharon started the process of developing TLC For Kids Nanny and Babysitting Service. Within the next few years the International Nanny Association (INA) was established and began to create standards and recommended practices for the industry. The In-home Child Care industry had became a reality and was evolving from a cottage industry into a major, nationally recognized field. Since then over 20,000 families have relied on TLC. TLC has evolved into a full service agency providing professional screening and placements of nannies, temp nannies, hotel babysitters, and tutors. TLC also provides postpartum Doulas and newborn overnight services for new parents. Motherhood has been the inspiration that not only created TLC For Kids, but also created an entire industry in the US. In addition to working on her own business, and the INA, Sharon has spent the last 20 years consulting with start-up agencies throughout North America and has provided workshops for new and existing agencies to guide other entrepreneurs in their quest to provide safe quality in-home child care. In 2012 Sharon decided to expand her nationally respected TLC for Kids business into the bustling and ever-growing society of her home city of Miami. TLC in Miami is thrilled to announce that we have developed an outstanding staff of Miami caregivers comprised of teachers, social workers, degreed professionals, early childhood education students, elementary education students and experienced nannies. Continuing her mission of providing working mothers and their families with the flexibility, support, and trust that they need, Sharon and her team are looking forward to bringing this important service to families throughout the Greater Miami area. It is all too easy to fumble taxes when paying a nanny or other household worker. But, as the Wall Street Journal reported, the Internal Revenue Service is making it easier for people who may have mishandled such issues to make things right. The new tax amnesty program targets employers who improperly classified employees as independent contractors, allowing them to voluntarily agree to begin treating these workers as employees going forward, while virtually eliminating any liability for past unpaid taxes. TLC for Kids relies on Breedlove and Associates, a national nanny payroll company for their expertise and according to this agency, any nanny is considered a household employee if they are paid $1800 or more per calendar year (for 2012 and 2013). TLC For Kids strongly encourages all household employers to claim their nanny as an employee while filing taxes if they have met the monetary threshold and the nanny should be legally considered an employee of the household. If you would like to take advantage of the IRS Tax Amnesty or have any questions on the Nanny Tax you can contact Breedlove and Associates at 888-273-3356 or by visiting Breedlove online. TLC For Kids has opened a new location in Miami. TLC For Kids, Inc., St. Louis’ premiere childcare agency, has been helping families with babysitters and nannies for twenty-eight years. Now, owner Sharon Graff-Radell and her husband Gregg Radell, Pinecrest residents, have brought TLC to Miami. TLC For Kids Miami helps families who are looking for in-home childcare. For the first time, Miami residents will have access to a screened pool of temporary nannies available for emergency and back-up care in addition to their scheduled nanny and babysitting needs. TLC innovated the childcare services industry with its Temporary Nanny and Babysitter services. Along with assisting families with hiring a full-time or part-time nanny, TLC helps parents in a pinch when there is a last-minute need in the home because a child is sick or a scheduled sitter falls through. When clients need help on short notice so that they can attend an unexpected doctor’s appointment or a meeting, they can rely on TLC to come through with a great caregiver. All of TLC’s sitters are vetted by agency professionals, have verified references, background checks, and CPR training. TLC’s founder Sharon Graff-Radell has been involved in the nanny industry since 1985 and has helped agencies in markets across the county to better understand and service their clientele. She has also been on the board of the International Nanny Association and has earned numerous awards for her service. Gregg Radell, a Miami native, has been a successful small business owner for many years, working in varied areas of the electronics industry. TLC For Kids recognizes the difficulties families face in finding qualified caregivers to care for children with special needs. TLC caregivers take worry and stress away from parents while introducing your special needs child to new activities and exercises to ease his frustration. TLC would love to help your family find that perfect person to meet your child’s needs. The TLC staff includes professionals and paraprofessionals in the education and special education fields, as well as nurses, nursing students, occupational and physical therapy students and social work students who have experience working with children with a broad range of special needs including; autism, hearing loss, sensory disorders, ADD, ADHD, cerebral palsy, seizures and others. Many parents of children with special needs are hesitant to leave their children with neighborhood sitters who may not have the skills and knowledge to care for their children. Our professionally screened caregivers are available during the day, evening, and also on weekends on an as-needed basis for parents who need help sporadically. Visit our website register for a Special Needs Caregiver in Miami. TLC For Kids has opened a new location in Miami. TLC For Kids, Inc., St. Louis’ premiere childcare agency, has been helping families with babysitters and nannies for twenty eight years. Now owner Sharon Graff-Radell and her husband Gregg Radell, Pinecrest residents, have brought TLC to Miami. TLC For Kids Miami helps families who are looking for in-home childcare. For the first time Miami residents will have access to a screened pool of temporary nannies. Along with assisting families with hiring a full time or part time nanny, TLC offers temporary babysitters. When a client needs someone for a doctor’s appointment or a meeting they can call on TLC. TLC’s sitters are vetted by agency professionals. Sitters and nannies have verified references, background checks, and CPR training. TLC will also be able to help families with back-up care and sick child care. Sharon Graff-Radell has been in the nanny industry for over twenty eight years and has helped agencies across the county. She has also been on the board of the International Nanny Agency and has earned numerous awards for her service. Gregg Radell has been a successful small business owner for many years and is involved in the tech industry. TLC For Kids Miami can be reached at 305-256-5905 weekdays from 9am-6:30pm and is located in Pinecrest. To learn more about TLC and hiring a nanny or babysitter visit the website tlcforkids.com/Miami.